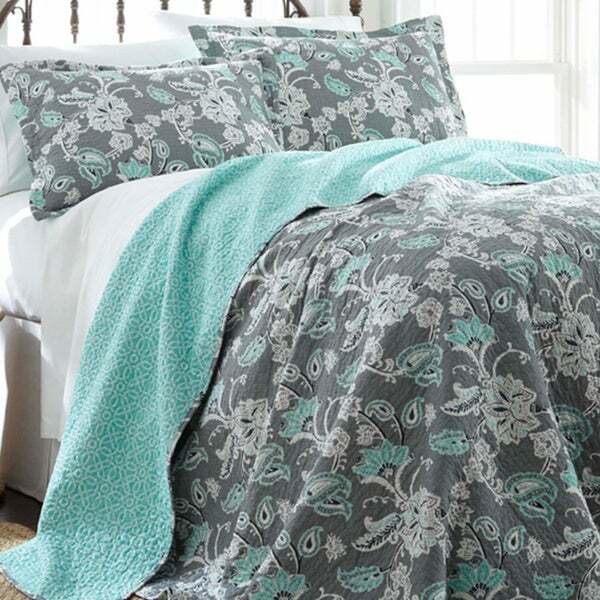 Truly a nice coverlet for warmer weather. Is also long enough. I wash on cold and partially dry. It is cotton and that is always so much more comfortable. Create a relaxing and tranquil environment in your bedroom with this beautiful three-piece quilt set. The gorgeous paisley-patterned design adds a fun look, while the light hues keep this wonderful quilt set from overwhelming your eyes. Constructed of cotton, this machine-washable quilt set is reversible, allowing you to easily change the look of your bed. This is a very nice quilt. I only gave it 4 stars because I wish it was wider. 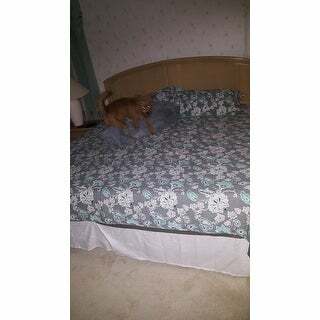 I have a king sized bed and the quilt only hangs down about 5 inches on each side. Other than that it is beautiful and is not too thick for Florida so I can use it in summer or winter. I wash my quilt set usually 2x a month. It has held up great and is a great purchase. fit my king size bed very well with extra to spare. Lightweight, comfortable. Gray sheets are perfect match. Now to paint. Ugh. This quilt is just as beautiful as the picture! We have a king size bed and there is plenty of overhang to cover our 12" tall mattress on all 3 exposed sides of the bed. It's soft cotton for easy care/wash. I couldn't be more happy with this purchase! I purchased this quilt because I loved the colors and design, it goes perfectly with my room !! The colors are just as shown. I was looking for something to sleep with for the summer since I'm a hot sleeper and the comforter I had was making me way too hot.. This is now my new favorite quilt!! It is so soft abs the perfect material, especially for summer.. I love it so much that I will probably keep it on my bed all year!!! I plan on ordering more quilts like this for my other rooms!! Love the colors of this set. They are vibrant and refreshing. The quilt itself is soft and warm. Very pleased with this beautiful quilt set. I love this quilt. There is a dark teal worked in to the pattern, works well with my teal curtains! My daughter loves this quilt! It is a darker gray and a bright turquoise blue so it isn't a muted look. It adds that bright turquoise she likes without being overwhelming in her room. I think it would look great with a good coral or yellow throw blanket and pillow for accent colors. It is a thin quilt but good quality and just what you want from a quilt. Very happy with this quilt. I looked around for a long time to find a set for my husbands bedroom this set was perfect. The quality is very nice and it looks beautiful in the room, I would definitely recommend this set! I am totally done with Overstock. This is not the first time this has happened. The colors were nothing like the photo, the sticking was coming loose and very poorly made. I contacted Overstock and they sent a return label but then deducted $* from my refund to cover the shipping even tho it was their fault. Will NEVER shop with Overstock again and will warn all my friends. Colors not as vibrant as expected but this has held out well after several washes and is a great value for the money. My wife picked this for our bedroom and we love it. It is just the right thickness and warmth and it's very soft. The color is nice and relaxing and I would definitely recommend to someone looking for a quilt. This is the best blanket ever. I’m such a hot sleeper, but I don’t wake up with night sweats anymore with this blanket! And the sheets I bought here. Goes perfect in my room. Color is turquoise not teal, but looks so nice I will keep. Nice quality! Kept me the perfect temperature all night. Purchased for my daughter and she loves. A bit thinner than I thought would be but works well for summer. The colors are true to pictures. Recommend to anyone who wants a pretty thin quilt. Very nice, medium weight quilt. Looks like the picture. I would buy this again. Bought this for a room I'm redoing and it's quite pleasing to the eye. Seems to be well made although I haven't laundered it yet. 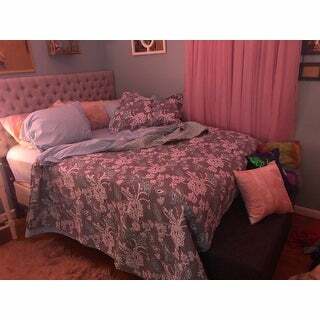 Would definitely need a blanket or two under it for winter months but just it and sheet set for summer. This spread is really lovely. The colors are true to the picture and the material is quite soft. I would definitely recommend this to a friend. Beautiful colors and a generous size! "If wanting to use this as a bedspread for a queen bed would you suggest getting a king size"
"Are both sides of the pillow the same? " Yes, the same print is on both sides of the pillows. "Is the dark color in the small spots a dark blue?" No it is not blue. It is a very dark green color. I like this comforter although the material was rather thin. I have it in a guest room and have not washed it so i don't know how well it will hold up. I ordered this same quilt, but the color of mine is real. I think the color at the centers of the paisleys or leaves is either black or a dark charcoal. This is a beautiful quilt. Just washed it for the first time and it came out of the dryer still looking new. "Does this fit as a bedspread or a comforter? Does it need a bedskirt?" It fits like a comforter. You do need a bedskirt. I use a white on with it. It's a beautiful quilt. I don't have a single complaint. Fits as a comforter, but it is a quilt. Yes, unless you have a platform bed, you will need a bedskirt. "I need another king quilt. My puppy found the quilt irresistible. Will you get more sizes in? Can I purchase just the quilt?" We don't have a restock date set yet. Yes, it is not rough or scratchy. I absolutely love it! "I can't tell from this picture if the colors are teal, aqua or green???????????" The color of the quilt set is Turquoise, in our opinion. Color is open to interpretation. Please remember, due to the difference of monitor colors, the colors on some of our items may vary slightly. Thank you. I have this sent in my home, and I would call it more of an aqua or mint green. It's beautiful.